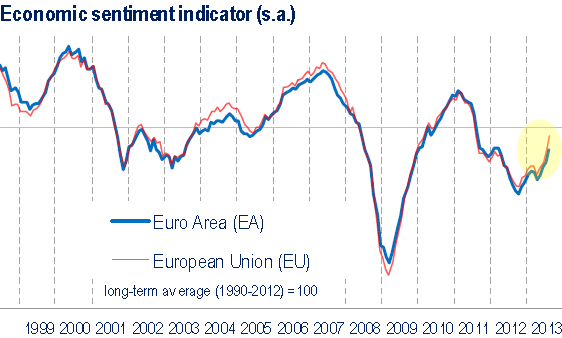 Sober Look: Euro area recovery continues; could growth surpass the US? 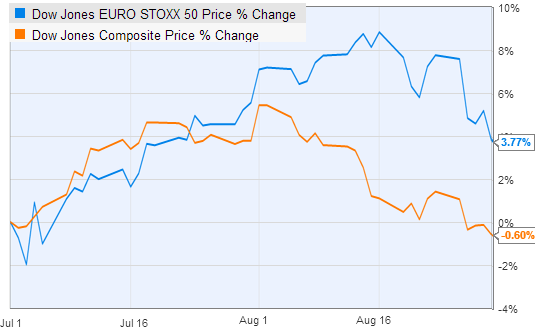 Euro area recovery continues; could growth surpass the US? In spite of an ongoing weakness in credit growth (see post), the Eurozone is continuing to show fairly robust economic improvements. Today's manufacturing PMI (manager surveys) has surprised to the upside. It is interesting to see Greece for example begin to show significant positive momentum, as the nation's multi-year manufacturing contraction is about to end. Weakness in France on the other hand is still a drag on the area's manufacturing sector. Barclays Research: - PMIs now suggest that manufacturing expansion in the euro area is set to continue around a pace of 1.5-2.0% y/y, with Germany and Italy among the strongest. With new order components nicely above 50 points in most countries, the outlook is also significantly improving. That said, PMIs in France remained at an excessively low level, unrelated to positive underlying growth momentum. In the remainder of the euro area, the Netherlands has been staging a significant rebound from 49.1 in April to 56 in August (output component). Other area indicators, such as economic sentiment, are moving in the right direction as well. Even the unemployment rate seems to have peaked (see Twitter post) - though remains at historically high levels. Given the ongoing credit crunch, this recovery is of course still expected to be painfully slow and uneven. But if such trends continues, the area's economic growth could potentially surpass that of the US - especially given the headwinds the US is now facing (see post). Sounds ridiculous? Take a look at what the equity markets have been telling us recently.